Dr. Lalthakim Hmar is presently working in the department of English, Assam University, Silchar as an Assistant Professor, Stage II. She has been working in this university since 2007 and, prior to joining this institution, she worked in a college for about two years. She holds M.A in English from Gauhati University and Ph.D in Cultural Studies from Tezpur University. She has interests in Literary Theory, Ethnic Culture and Women Studies. She has published a non-fiction book titled, Expressive Behaviours of Hmar Women. She wrote and published poems, both in English (Highland Musings) and Hmar (Sinlung Sermei) versions. She also published research articles titled “Proverbs: Absolute Truth of ‘Humanity’?” in Critical Space and “Women’s Speech Styles and Literary Features” in Wizcraft Journal of Language and Literature, both of which are peer reviewed journals. She presented a paper on “From the Private Domain to the Public Sphere: Mediation of Ethnic Inheritance and Christian values in the Lives of Hmar Women” during a Seminar on ‘Anthropology of Religion and Minorities’ held at Cotton College State University, Guwahati. Besides these, she also has several articles in college and students’ magazines to her credit. 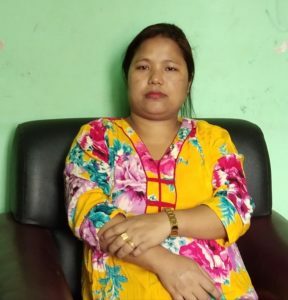 She has been appointed as the Coordinator of FSLE-India for its Assam Central-South (CS) Region.